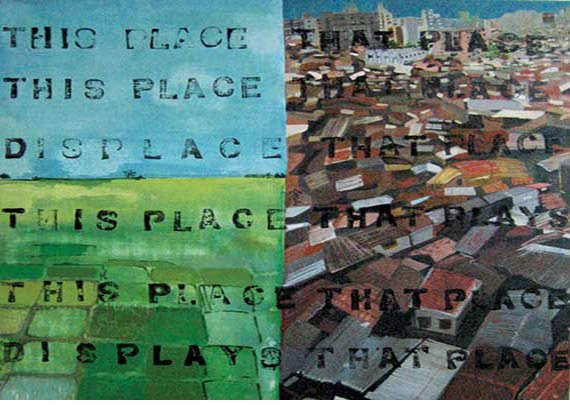 Kiran Chandra combines painting and print-making techniques to comment on the transformation of landscapes by a process of development founded on a will to reduce diversity to a monochrome. Language overlays image, constantly shifting meanings and challenging established referents. 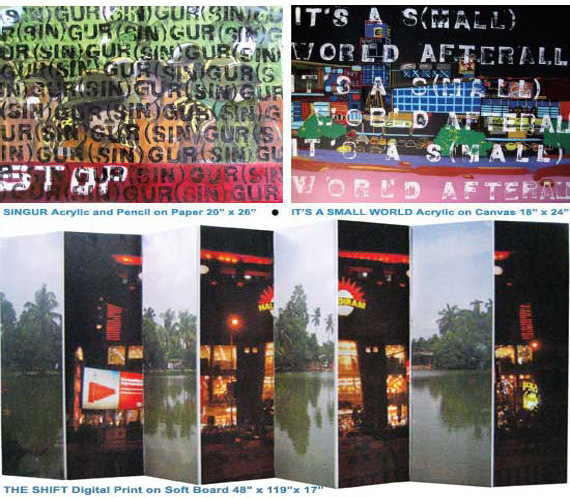 The artist likes to use the mundane imagery of everyday life only to subvert what they speak of and reform is the big unfinished business of independent India. Though it was on the agenda of the Congress, which assumed the mantle of the state, attempts to eliminate intermediaries, give security of tenure to small and middle peasants and impose ceilings on landholdings were never implemented even when legislation to achieve these ends were exemplary. Despite the socialist rhetoric of ruling parties--across the political spectrum--on the ground, the power of entrenched interests usually prevailed because they were needed to deliver power to those who had the ambitions of governing. Over 60 years, the state has failed to bring about any form of egalitarianism in rural society by redistributing land. Over the past one and a half decades, with important political economy shifts, even the rhetoric of social justice and equity has found a rapidly shrinking space in the agenda of governance. And with market-arbitrated solutions to social and economic problems becoming the dominant orthodoxy, achieving more equal access to land--whether in the countryside or in urban centres--is becoming a distant possibility.